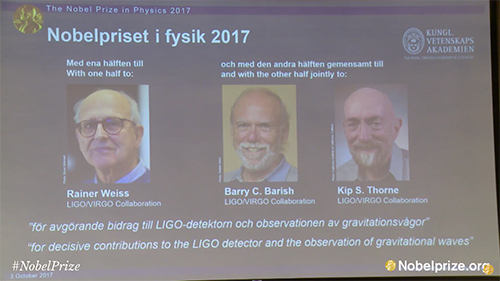 Congratulations to Rainer Weiss, Barry C. Barish and Kip S. Thorne from LIGO-Virgo collaboration and Laureates of 2017 Nobel Prize in Physics. This Nobel Prize, in the field of gravitational waves physics, emerges as a turning point in science. Gravitational waves are an important research area of LAPP’s team. They also were at the center of several announcements since their first detection. First detection announcement in February 2016, 2017 CNRS gold medal awarded to Alain Brillet and Thibault Damour, first LIGO-Virgo joint detection… In this rich context, the 2017 Physics Nobel Prize is today awarded to Rainer Weiss, Barry C. Barish and Kip S. Thorne for their work about gravitational waves. Find more information about the researches of Rainer Weiss, Barry C. Barish and Kip S. Thorne on the official Nobel Prize website. The awarding of the 2017 Physics Nobel Prize to Rainer Weiss, Barry C. Barish and Kip S. Thorne shows the importance of research about gravitational waves, a major field of today’s physics. We are looking forward to the next surprise gravitational waves will bring for us !